Bowers & Wilkins has signed on as a technological sponsor for the upcoming independent film, Love In Training, written and directed by Andrew Robinson. Bowers & Wilkins will be providing the film's post-production team with loudspeakers from their CT800 Series to be used in the audio mastering process for the film's eventual theatrical and home video release. • Read more movie news from HomeTheaterReview.com. • See related Floorstanding Speaker news from Home Theater Review. • Explore reviews in our Floorstanding Speaker Review section. Bowers & Wilkins' CT Series or Custom Theatre Series, is the manufacturer's top of the line, custom installation loudspeakers designed for Hollywood style screening rooms as well as discerning consumers alike. The CT800 Series, which is to be used by the sound engineers working on Love In Training, is the pinnacle of the line; borrowing technology and materials used in Bowers & Wilkins' famed 800 Series Diamond loudspeakers. The 800 Series Diamond loudspeakers can be found in recording studios and mixing houses the world over, the most notable being Abbey Road Studios in London. "I'm pleased that Bowers & Wilkins has agreed to play a crucial role in the production and post production process for my new film," said Robinson, the film's director. "Having used Bowers & Wilkins' products personally for many years I was excited to get the opportunity to work with them in professional capacity -one that I feel will benefit not only the film, but the audience as well." 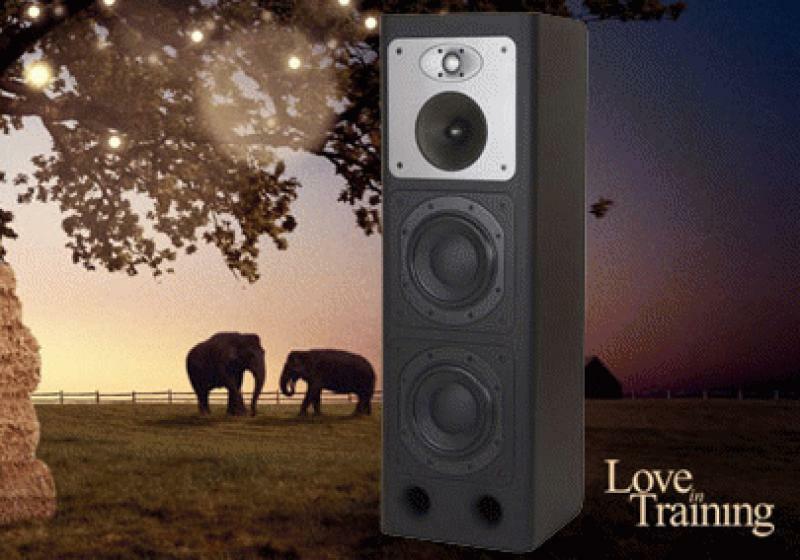 The post-production team behind Love In Training will be utilizing Bowers & Wilkins' CT8.2 LCR loudspeakers in a 5.2 multi-channel configuration. The CT8.2 LCR is the most versatile loudspeaker in the CT800 series; able to serve as either right and left mains, as well as a center or rear channel speakers. The CT8.2 is a two-way, open box design featuring Kevlar brand fiber drivers and Bowers & Wilkins' trademark tube loaded tweeter technology borrowed from their Nautilus Series. Production has also chosen to use two subwoofers from the CT Series; the CT SW12. The CT SW12 is a closed-box, passive subwoofer designed to provide bass reinforcement to the rest of the CT800 Series loudspeakers down to 17Hz. The two CT SW12 subwoofers are powered by a Bowers & Wilkins' 1,000-Watt SA1000 rack-mountable subwoofer amplifier. MSRP for the CT8.2 is listed at $8,000 each, with the CT SW12 subwoofers listed at $1,000 each and $1,500 for the SA1000 amplifier. Products are currently available worldwide via select Bowers & Wilkins dealers and custom installers. Love In Training is the second feature length film from independent filmmaker Andrew Robinson. Love In Training is a light-hearted romantic comedy loosely based on Robinson's own experiences working at a private wildlife facility. A portion of the film's budget, as well as proceeds, are being donated to wildlife conservation efforts around the globe. Robinson's previous film, April Showers, starring Tom Arnold (True Lies) and Illeana Douglas (To Die For) dealt with the trauma and psychological impact a Columbine-like school shooting has upon the survivors and surrounding communities. April Showers was written and directed by Robinson, who was a senior at Columbine High School during the April 20, 1999 shootings. April Showers was released theatrically in 18 cities nationwide in 2009 before later being acquired by WarnerVOD for distribution via video on demand (VOD) and streaming services. Are Home Theater Owners More Likely to Embrace Day-and-Date Movie Releases? Day-and-date movie releases, when the film is available on home video at the same time it hits theaters, are slowly becoming more common. Adrienne Maxwell wonders if home theater owners are more or less likely to embrace this trend. 10 Great Ultra HD Blu-ray Discs to Begin Your Collection Are you ready to embrace Ultra HD Blu-ray? We recommend 10 great UHD Blu-ray discs to begin building your collection.